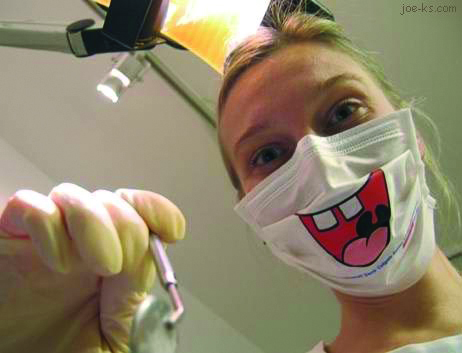 Dentists – Scarier than Clowns? Do y’all remember the clown doctors in “Pee Wee’s Big Adventure”? They were even scarier than Large Marge. Now, clowns are scary in general, but these top the list. I think it’s the whole hospital setting in the movie that also makes them so terrifying. With the exception of the bright dangling spotlight, it’s dark. That was, for a long time, my mental image of going to the dentist. I know, I know, most people don’t love going to the dentist. But I was really scared of going. I remember a hygienist that cleaned and inspected my teeth as a child being less than gentle with that scraper thing. Needless to say, my attendance suffered over the years. Last summer, I was playing tennis at the Brynwood courts. We didn’t have a ball boy that day, so we were scooping up buckets of balls. As I bent over to pick one up, my sunglasses slid down, blocking my line of sight. BAM. I hit my mouth so hard I saw stars. A dadgum metal chair had come between me and the ball. I still cringe thinking about it. I stood up, feeling lightheaded. I also felt bits of tooth in my mouth. It felt like most of my tooth was missing. I yelled to my friends that I’d broken my tooth and needed to leave. They told me to stop freaking out and let them see. So I let them see. All four of them said, “It’s no big deal at all! It’s barely broken! Just stay and finish the practice with us!” I was so surprised. I truly thought my tooth was gone. I stayed and played for about 45 more minutes. Well, they must’ve really just needed a fourth player because I got in the car, looked in the mirror and gasped. My original fears were realized. Not much tooth left. While I waited for my appointment time, I stopped at a furniture store to browse. We were looking for a couple of things for two recently remodeled rooms in our house. I actually found a television stand that I loved, so I called The Man to discuss. When he asked how much it was, I looked for a price tag and couldn’t find one. He suggested that I just ask the clerk about the cost. Couldn’t he hear my lisp? I realize that he hadn’t seen me yet, but there was a hole in my mouth. Arriving at the dentist, I covered my mouth as the sweet girl (hey Crystal!) at the desk asked me the new patient questions and handed me the paperwork. It included all of the standard stuff like health concerns, address, birthdate and Social Security number. One of the last questions was “are you happy with your smile?” I wanted to laugh but didn’t want anyone to see by broken tooth. Long story short (too late! ), I was fitted for a temporary crown and eventually the permanent one. It looks so good that most people wouldn’t even know I have a fake tooth. For any major procedure, nitrous is offered and I accept. The dentist isn’t nearly as bad as I thought. Mine is gentle and the drugs made the re-entry even easier. Today I went for a regular cleaning. Of course, they don’t give laughing gas for routine treatment. I’m happy to report that I didn’t need it. Instead, I got clean, shiny, healthy teeth and a flashy new yo-yo out of the treasure box. I am known, in dental circles, as a “gagger”. This means two things; 1) Dental x-rays are drama and 2) Dental cleanings are drama. And by drama I mean TNT plus Bravo plus Every Broadway show every written with a pinch of Dallas. Thankfully for those who are fellatiolly-challenged there are many Dentists in the metro Atlanta who offer nitrous just for cleaning. It makes for a bearable experience not only for the patient but for the hygienist as well.